Are you into safe hiking? 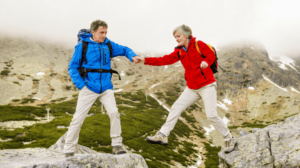 Do you know that, according to the CDC, the third most common source of injury in the wilderness is hiking, with hiking falling only behind sledding and snowboarding? Do you also know that more deaths and injuries are attributed to hiking than to more dangerous activities such as rock climbing? On top of that, Search, and Rescue (SAR) teams report thousands of searches each year with a significant number of those searches resulting in deaths. What makes these deaths and the thousands of injuries sustained each year in the wilderness is the fact that these instances can be attributed to three things, poor judgment, lack of experience, and lack of knowledge. In other words, people overestimate themselves and their capabilities while underestimating mother nature. Now, I know that many of you enjoy getting out into the outdoors, getting off the beaten path, and hiking, which is incredible. However, I have one question for you, do you ever think about your capabilities and work to minimize the potential danger to you and those who depend on you? In the end, hiking is fantastic, but safe hiking should be the goal. So, the goal of this episode and article is to provide you with some information to help you improve your safety when you do head out into the wild. The point being for you to have a safe and enjoyable time when outdoors, without becoming another statistic. The fact is most people don’t think about safe hiking or that the outdoors is dangerous. They take mother nature for granted. Often, they overestimate their ability. They don’t plan. Well, as someone who spent a reasonable amount of time in the outdoors, all of those points total up to equal a personal disaster, which we’re going to try and eliminate from your future by providing you with some thoughts to help you be safer when getting out to the clean air, and incredible times in the outdoors. Not being prepared for the Hike with ten points to help become prepared. Hey everyone, before I get into this episode, I want to start with a new show segment called, “Preparedness Wins and Fails.” This segment will be a short recap of a recent event that provides us with an example of why we should prepare. Now, if during the week, you have something happen to you, or you come across a story that provides an excellent example of why you should be prepared, feel free to email me at [email protected] and I’ll try to work it into the show. This week’s segment comes to us from San Antonio, Texas. According to police, a San Antonio mother, witnessed her son being attacked by a burglar, 31-year-old Geraldo Lopez. Lopez broke into the home, attempting to steal a computer. A male resident of the home discovered Lopez and confronted him. Unfortunately for the resident, Lopez attacked him. However, fortunately for the victim of the attack, his mother came to the rescue. Seeing her son was being attacked, the mother picked up a porcelain canister and smashed Lopez over the head with it, ending the attack, and subduing him before his taxpayer sponsored ride to jail. Way to go, mom! First, virtually nothing in your home other than your family members is worth your life. So, think twice before confronting a criminal. Criminals are often more violent with a willingness to commit violence that many times exceeds the average person’s understanding of what the situation could entail. Whenever possible, avoid the confrontation, move to an area of safety, and call for law enforcement. Second, when you, a loved one, or another innocent victim is in a precarious situation that you decide to become involved in, make sure you use speed and violence of action to end the situation quickly as this mother did. If not, you stand a chance of becoming an additional victim for the criminal to beat on. With that, never forget, that when attacking someone, even in defense of another, you open yourself to potential physical harm and legal problems that may come from the criminal. While it’s not right, criminals can and do sue people who attack them during the commission of their crime. Now, as mentioned earlier, if you have something happen to you, or you come across a story that provides a good Preparedness Win and Fail, please email me at [email protected] and I’ll try to work it into the show. Staying on known and marked trails makes is one of the easiest ways to avoid being lost. Therefore, if you remain on a known trail, you’ll increase your chances of not getting lost. However, if you become lost, or as we said in the military temporarily mis-oriented, staying on a known trail, will help search and rescue (SAR) teams find you sooner. SAR teams most commonly search along trails. So, the farther you wander away from a known path, the less likely your chances are of being found. Shortcuts. Typically taking off-trail shortcuts is discouraged. You can harm the area by blazing your trail. However, if you must take a shortcut, make sure to take a few minutes to look at your map to make sure you’re not going to get yourself into a jam by not knowing what you’re walking into. Carrying the right gear and supplies is super important no matter how long of a hike you are going for. Just like on Gilligan’s Island, what starts out as a short, but fun adventure, can turn into an extended survival situation should Murphy rear his ugly head. Therefore, you need to be prepared when heading out for your three-hour tour. The amount of water you need to carry depends upon your environment, the difficulty of the hike, and how long you’ll be hiking. Remember, it’s always best to err on the side of caution when it comes to a life-sustaining resource such as water. The best way to avoid getting lost is to know where you are. So, even if you’re going to an area that you think you know well, take a map with you. Preferably you’ll find an excellent topographic map. Also, don’t forget, if you don’t know how to read a map, learn before you go. It’s not difficult, and it’s fun. Not to mention it could save your life. The Garmin Foretrex is excellent little GPS unit for $150. On Amazon, it’s rated at 4 ½ stars with almost 550 reviews. It’s lightweight, reliable and sells for about $150. I used one of these units for years overseas and still carry one to this day in my bug out bag. It’s not a fancy unit, but it’s lightweight, comfortable to operate and convenient to carry. This $204 GPS unit is rated at 4-stars with over 900 reviews on Amazon and comes in a variety of configurations. With its quad helix antenna and high-sensitivity Global Positioning System (GPS) and GLONASS, which stands for “Global Navigation Satellite System” receiver, GPSMAP 64st locates your position quickly and precisely and maintains its location even in heavy cover and deep canyons. The advantage is clear — whether you’re in thick woods or just near tall buildings and trees, you can count on GPSMAP 64st to help you find your way when you need it the most. For those who may not know, GPS is the U.S based satellite navigation system with 33 satellites in orbit. Our GPS system is undergoing an upgrade to provide users with an accuracy of less than one-foot when plotting your position. Additionally, similar to GPS, GLONASS is the Russian based satellite navigation system with 24-orbiting satellites that is similar to and can act as a back-up to GPS. It’s worth mentioning that you should always have and know how to use a map and compass as a backup to a GPS. In addition to the usual problems associated with electronics, along with potential satellite decay, GPS and GLONASS systems have the potential to be shut down by their respective governments, as happened to the Indian military during the 1999 Kargil War, which was part of the ongoing conflict between Pakistan and India. The $155 Bad Elf 2200, is rated at 4 ½ stars on Amazon, with over 400 reviews. It is an external GPS receiver, that uses Bluetooth wireless technology to feed GPS data directly to up to five (5) paired iPod touch, iPhone, or iPad devices. This GPS has satellite lock, battery life, latitude, longitude, altitude, direction, speed, and time directly display on the backlit LCD screen and a data logging feature to record trips. If you become lost, odds are you may be spending the night in the woods desert, or wherever you are. Therefore, plan on being able to see and signal to others. White light can be seen for miles at night. Not to mention aiding you in seeing problems in the dark that would otherwise cause you a problem. In the event you’re stuck out overnight or are stuck in poor conditions, having the ability to light a fire for warmth and signaling is very important. Spending the night or a few days in the wilderness can result in some small and also severe injuries. The downside is that even minor injuries can be a problem when out in the wild. Having the ability to clean and cover a wound is essential for proper hygiene and safety. When prepping your first aid kit make sure to consider the type of injuries that you are most likely to experience. For example, when working in the kitchen, expect to slice your hand on broken glass. Similarly, when going outdoors, expect to suffer ankle sprains and bone fractures. So, pack ace wraps and other joint support methods along with SAM splints, etc. Should you become lost, having the ability to signal to others and searchers is critical to a successful outcome. So, consider a reflective signaling mirror and a whistle or other noisemaker when packing your outdoor kit. Never leave home without it. I prefer a multi-tool as opposed to a larger knife with a narrow focus of use. A multi-tool will prove so useful; it may just amaze you, not to mention saving your life if you become lost. Carrying clothing appropriate for the environment and hike itself is a crucial task when preparing to go out for a walk. Warm summer days can lead to freezing night. So, think ahead and be prepared. This doesn’t need to be a tent. A tarp and ingenuity can work as well as a stout, and less packable tent does. If you are concerned with getting lost, use colors that stand out. Likewise, if you’re concerned with blending in, more natural colors will do the trick. Too often people head off into the wilderness for an easy hike, with no plan in place. You’re wrong if you don’t think of a plan ahead of time. Thinking of a plan ahead of time means thinking about where you’re going and for how long, even before you leave the house. If you have a GPS, start by entering essential waypoints such as the trailhead, parking lot, nearby ranger stations, and other points that are important to you. Next, write down those waypoints and their coordinates, along with an overview of the trail and route you plan to hike. Make sure to include your name, start time and expected return time, along with contact info for yourself and relatives. Leave a copy of the plan at home, with a friend and one copy in your car at the trailhead. People often try to find their way out of a dangerous situation by continuing to walk around. Typically, if you become lost, you should sit in one spot so that you don’t make a dangerous situation worse. However, if you are 100% certain you know your back trail, you can try to backtrack to a more likely location to be found. If not, then stop, sit, listen and do what you can to protect yourself from the environment while also working to be noticed by SAR. When hiking, some ways to help find your way home include using your GPS and map and compass to establish waypoints that you can backtrack to. Also, think about taking photos of the trail and significant terrain features in front of or behind you at specific points. That way, if you get turned around, you’ll be able to confirm your location relative to your photos. Also, consider carrying some marking tape, chalk, etc., with you. That way if you become lost, you can mark your path if you move around which as mentioned before may not be such a great idea. In the end, like all things with preparedness, having gear is no good unless you know how to properly use it. Also, it’s important that you know how to use your brain, so that you stay out of trouble. Remember, it’s not the action you take that gets you into trouble. Instead, it’s the thought to do the action that is the real culprit. So think before you step! Patience can be difficult, especially when you’re getting lost and nervous. Never forget, it’s important that you don’t make a bad situation worse. Stay calm, think things through, and make decisions that are helpful instead of harmful. Don’t be in a rush and think things through. Always stay calm and prioritize what you need to do to ensure the best possible outcome. If you have any other thoughts or questions about safe hiking, please leave a comment below. Thanks for Listening to This Episode on Safe Hiking.